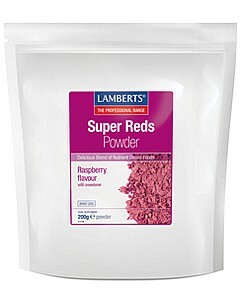 This all-natural super reds powder contains an exclusive blend of nutrient dense foods, specially chosen for their ‘active’ compounds. An exclusive blend of nutrient dense foods This all-natural super reds powder contains an exclusive blend of nutrient dense foods, specially chosen for their ‘active’ compounds. Goji berry fruit, baobab, redcurrant, blueberry, strawberry, raspberry, pomegranate and montmorency cherry combined with beetroot powder to create an unrivalled blend. Goji Berry Fruit Powder, Beetroot Powder, Redcurrant Juice Powder, Raspberry Powder, Natural Flavouring with Sweetener: Stevia, Blueberry Juice Powder, Strawberry Powder, Baobab Pulp Powder, Montmorency Cherry Powder, Pomegranate Powder.